Latest research shows that schistosomiasis, a disease caused by flatworm parasites, may have been spread by earliest crop irrigation in ancient Mesopotamia, suggesting early technology exacerbated disease burden. 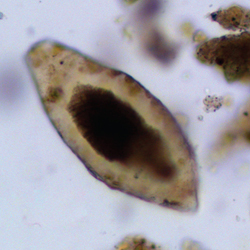 The discovery of a schistosomiasis parasite egg in a 6200-year-old grave at a prehistoric town by the Euphrates river in Syria may be the first evidence that agricultural irrigation systems in the Middle East contributed to disease burden, according to new research published in Lancet Infectious Diseases. Schistosomiasis is a disease caused by several species of flatworm parasites that live in the blood vessels of the bladder and intestines. Infection can result in anaemia, kidney failure, and bladder cancer. This research shows it may have been spread by the introduction of crop irrigation in ancient Mesopotamia, the region along the Tigris-Euphrates river system that covers parts of modern-day Iraq, Iran, Kuwait, Syria, and Turkey. According to co-author Dr Piers Mitchell, from the Division of Biological Anthropology at the University of Cambridge, the discovery might be among the oldest evidence of man-made technology inadvertently causing disease outbreaks. “The individual who contracted the parasite might have done so through the use of irrigation systems that were starting to be introduced in Mesopotamia around 7500 years ago. The parasite spends part of its life cycle in snails that live in warm fresh water, before leaving the snail to burrow through the skin of people wading or swimming in the water,” said Mitchell. The discovery at Tell Zeidan in Syria was made by an international team of archaeologists and biological anthropologists from Cambridge, the Cyprus Institute, and the University of Chicago’s Oriental Institute. It shows that the parasite infected humans there at least a thousand years earlier than has been found in Egypt. The oldest schistosomiasis egg found previously was in Egyptian mummies from 5200 years ago. The egg was found in the pelvic area of the burial where the intestines and bladder would have been during life. Control soil samples from the head and foot areas of the grave contained no parasitic eggs, suggesting that the gravesite was not contaminated with the parasite more recently. “Schistosomiasis has become progressively more common over time so that it causes a huge burden across the world today, with over 200 million people infected. It causes anaemia which significantly decreases physical productivity in infected people, and may also cause bladder cancer,” said Mitchell.